We are at T-Minus One Week and counting. Summer’s ending, schools elsewhere have begun. I received my schedule this week. I’ve had my first dream. My mind’s planning. It…has…begun. 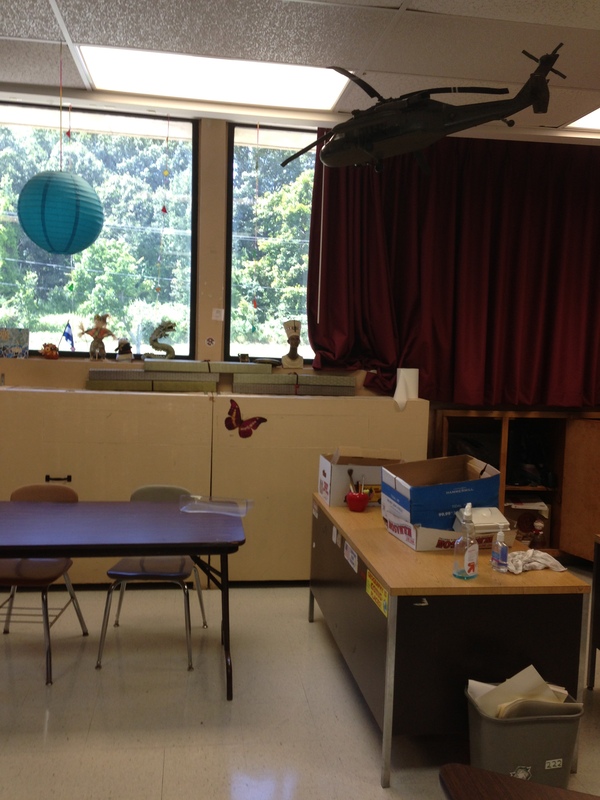 My teacher friends post room pix that look like they have professional decorators. I stand in the middle of my room. I’m inferior. No professional decorator here. I do a 360. We’re in design shape. I unpack items. First thing’s first, I set up the Keurig corner. Tons of caffeine. I’m not sure if that pot, for which I have a deep, unhealthy love, is my spiritual confidante or a street-corner drug dealer. Cups in place, not a drizzle of tar-pit of agave spilled by colleagues rushing to return to packed classrooms. The refrigerator hums a quiet greeting. The “food and beverage corner” is complete. I can live in this room. “Dead Guy Display” has fallen, warped. I’ve no double-sided sticky tape. The fallen men of history must remain so until I hit the store for adhesive. Under them, the bulletin board–black stretch felt punctuated with a million staples, corners of papers clinging for dear life. Every once in a while a student with OCD removes staples as an extracurricular activity. I used to decorate in themes–cultures from around the world. I look around now. The room’s now an amalgamation of things I liked best–relics from stained glass hobby days hung in windows, waiting to catch afternoon light. World flags, favorites long missing due to student appropriation. They’ve been rearranged by one astute scholar who put all the bitter enemies side by side in a fit of political humor. Helicopter hanging over my desk, secured with fishing line, a gift from a colleague who’s moved on in life. Hung securely–until someone jumps up and whacks it…”Look, Miss, it’s flying!” One day it’ll crash to the earth. I should probably take it down. Not done setting up. This is the opposite of the pictures my perfect teacher friends have. I want to win a contest where they redo my room. I clean my fish tank, filling the five-gallon buckets with a half-summer of sludge. One cichlid remains. I wheel the sludge to the science lab, only to remember–it’s gone. It moved to another part of the universe. I didn’t realize they were taking their sink with them. I fill up the five-gallon bucket yogurt container by yogurt container in the student bathroom sink. I reflect upon the Asian saying that you really do fill a bucket one drop at a time. I thought they were talking about wisdom, not standing in front of a bathroom sink for all eternity. I go back to my room. I unpack “cultural items.” Chinese and Tibetan Buddha, teapots, ink wells. “No, we don’t refer to the Buddha as ‘the fat guy’ and ‘the skinny guy,'” I say at least once a year when we get to that part. The japanese tetsubin start conversations which result in me preparing tea, The inkwells are empty–calligraphy relics–but are pretty enough to stand tall in the display. A beautiful cherrywood collage has fallen to the ground. I thought it would stay forever, I secured it so well. Images of students who passed through these doors long ago. It will stay down. I am making room for the new. I realize this looks like my room got attacked by Woodstock. You can’t see the beads to the left. I remove thumbtacks from the neon floral board I painted. It’s near the hippie door beads kids love to touch when they enter the room. I look up. Haight-Ashbury gone very badly. I contemplate removing the paper lanterns hanging from the ceiling. This room looks like it’s all over the place–no theme–very much like the contents of my mind. Perhaps that’s good. I try to connect seemingly unrelated things. The Occupational Therapist suggested, “Get rid of some of this. 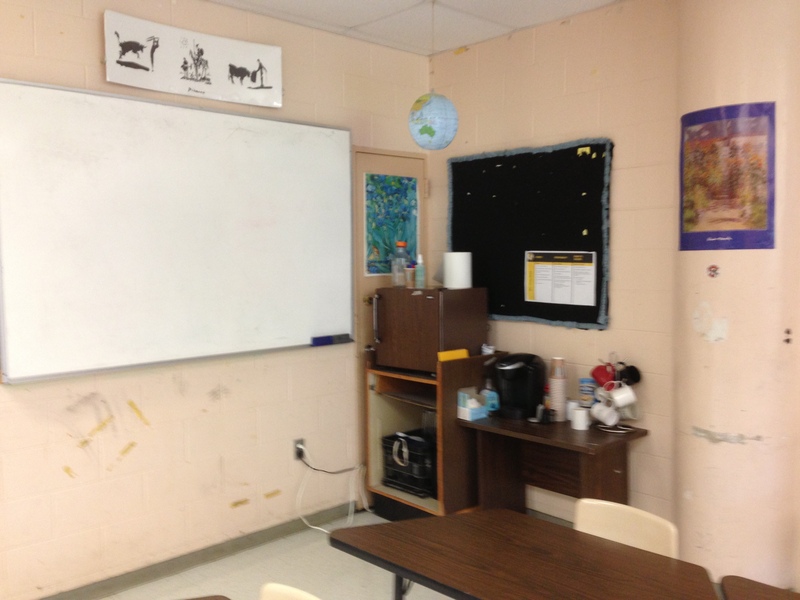 It might help you and your students.” She wanted me to get rid of furniture. No teacher in their right mind gives up a filing cabinet, though, so I conceded to hide the lava lamps. They’re coming back out now. They’re back in style. I had them out when they weren’t. I stand in the middle of the room. I’m not going to finish today. I throw out a bunch of stuff–simplifying is my theme this year–allowing myself “one box of crap” that I will pack away and sort later. I fill the box. I finish my coffee. I walk through door, touching the beads, just like my students. They jingle. I pause in the doorway. Perfect or not, this room will soon be filled with a couple-hundred faces staring at me, hoping I’m not going to waste their time. I won’t. How can anyone with a lava lamp waste your time? 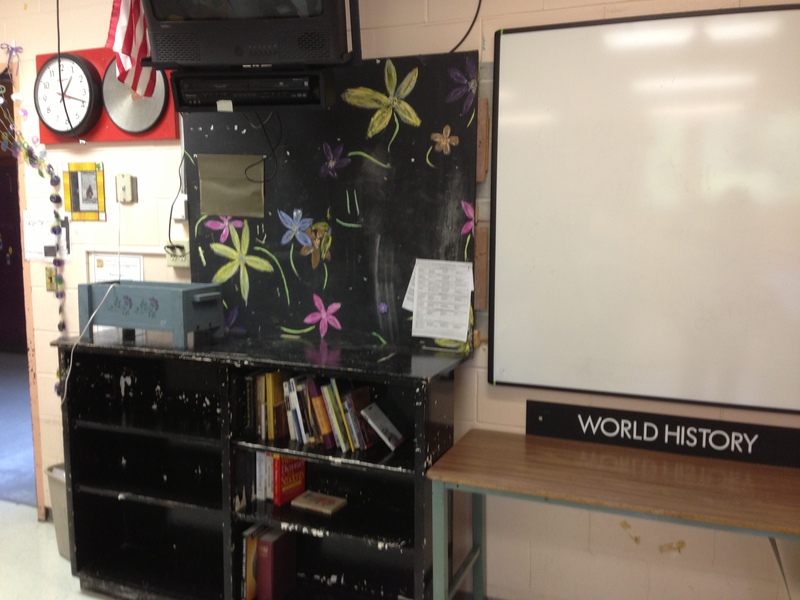 sweet (and some not so sweet) memories of decorating classrooms. You took me back in time a bit. Thanks.